The Full Moon is Monday, April 30. 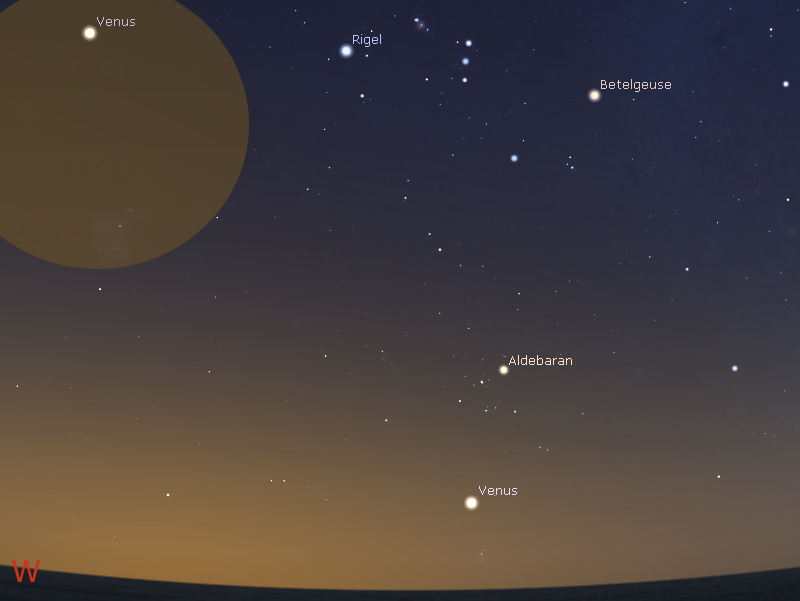 Venus is high in the twilight and passes below the Hyades cluster and the bright star Aldebaran. 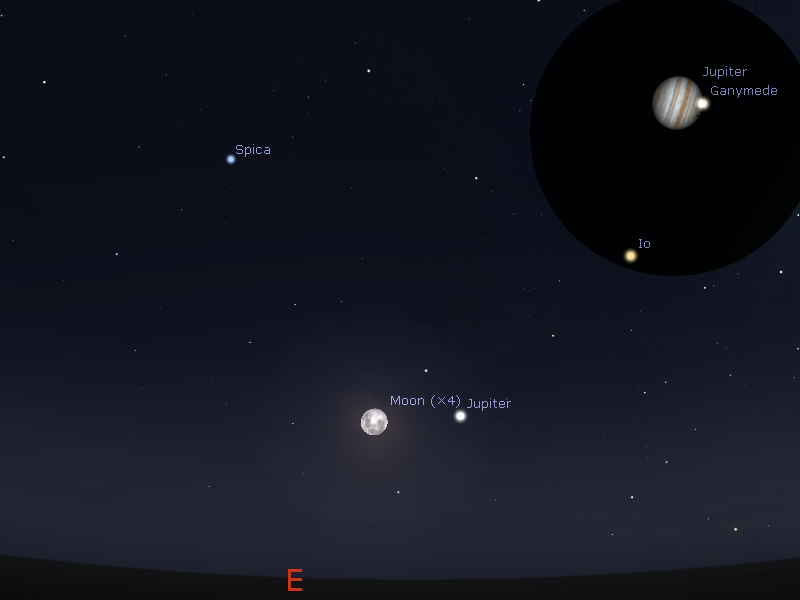 Jupiter is now rising in the early evening skies and is visited by the Moon on the 30th. Venus is setting as Jupiter is rising. 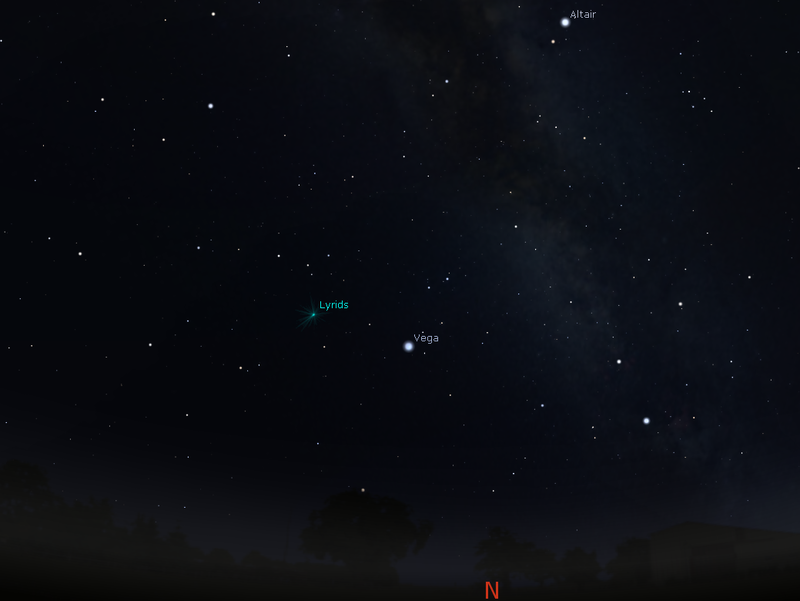 Mars and Saturn are now visible in the late evening skies. Mercury is prominent in the morning skies. The Full Moon is Monday, April 30. Evening twilight sky on Thursday April 26 looking west as seen from Adelaide at 18:20 ACST (45 minutes after sunset). Venus is just above the Pleiades in the twilight, and below the Hyades. and the bright star Aldebaran. 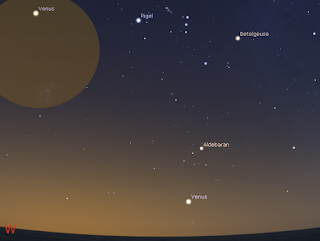 The inset shows the binocular view of Venus and the Pleiades. Venus is rising higher in the twilight. Venus is visible to the unaided eye from 15 minutes after sunset, easy to see 30 minutes after sunset and can potentially be viewed as late as an hour after sunset if you have a flat, unobstructed horizon. Evening sky on Monday April 30 looking east as seen from Adelaide at 19:05 ACST (90 minutes after sunset). Jupiter is above the horizon close to the full Moon. The inset is a simulated telescopic view of Jupiter and its moons at 04:00 ACST on the 30th, with Ganymede and its shadow transiting the face of Jupiter. Evening sky on Saturday April 28 looking east as seen from Adelaide at 23:00 ACST. Mars and Saturn are above the eastern horizon. The inset is a simulated telescopic view of Saturn and the globular cluster M22. 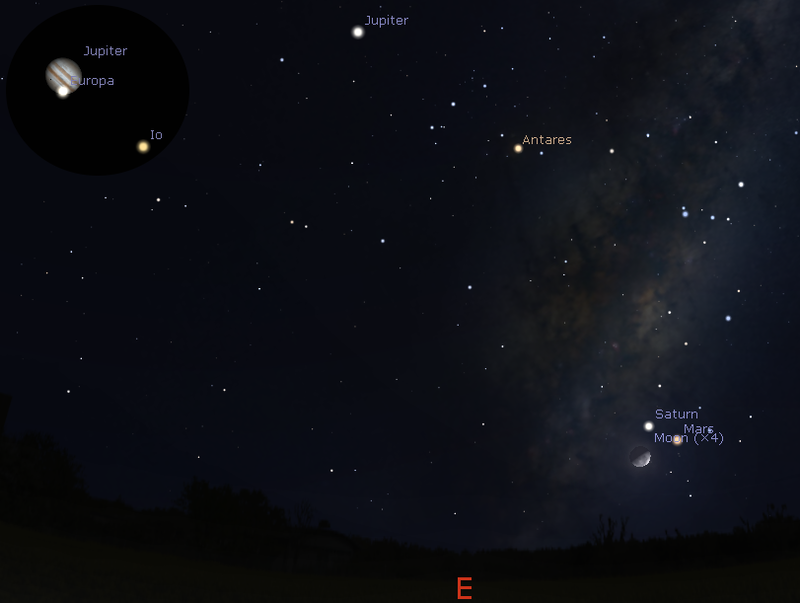 Similar views will be seen throughout Australia at the equivalent local time (90 minutes before sunrise). Morning sky on Saturday April 28 looking east as seen from Adelaide at 5:45 ACST (60 minutes before sunrise). Mercury is the brightest object closest to the eastern horizon. The inset shows a simulated telescopic view of Mercury. Venus is now sufficiently high in the evening twilight to be readily visible above the horizon if there are not too many trees or buildings in the way. It is now one and a half hand-spans above the horizon 30 minutes after sunset. It is bright enough to be visible 15 minutes after sunset and easy to see 30 minutes after sunset. Venus can potentially be viewed as late as an hour after sunset if you have a flat, unobstructed horizon. Venus starts the week just above the beautiful cluster the Pleiades, but in the twilight glow you will need binoculars to see the Pleiades. As the week progresses Venus leaves the Pleiades behind and glides past the V shaped Hyades cluster and the bight red Star Aldebaran. 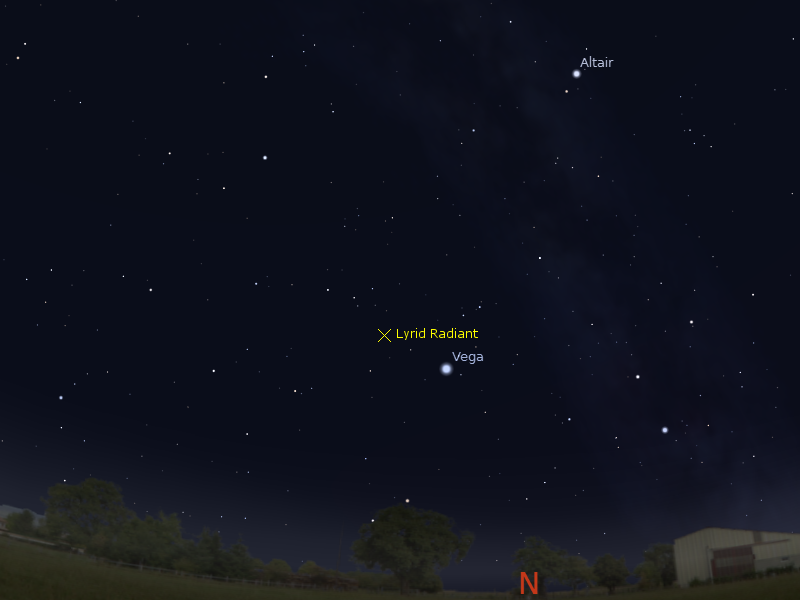 Venus is closest to Aldebaran on Thursday May 3. 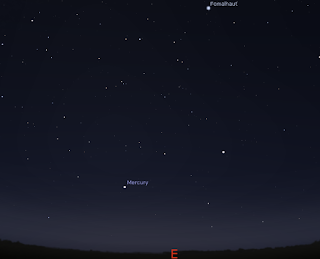 Mercury has returned to the morning sky, and now is in an excellent position for observation. Mercury is the brightest object above the eastern horizon. 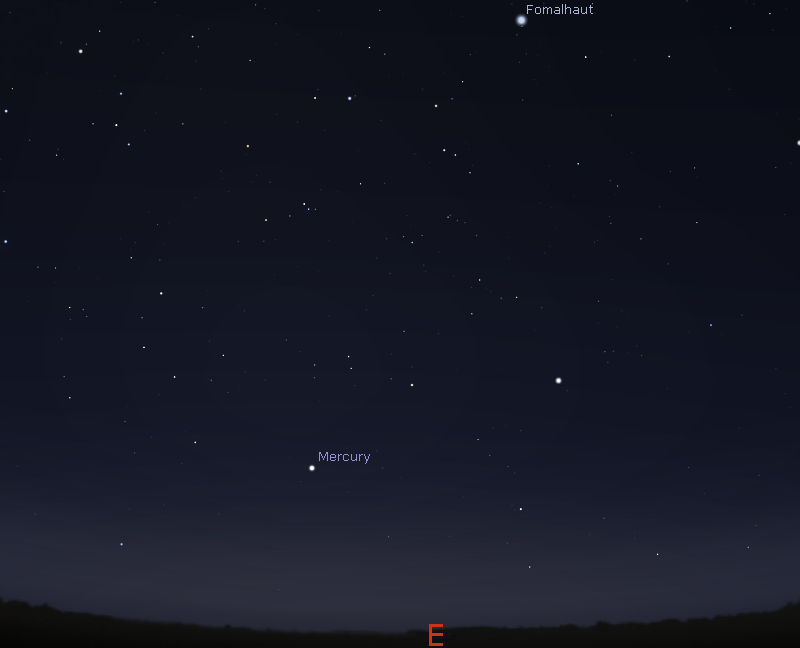 Mercury is now high enough for telescope observation. 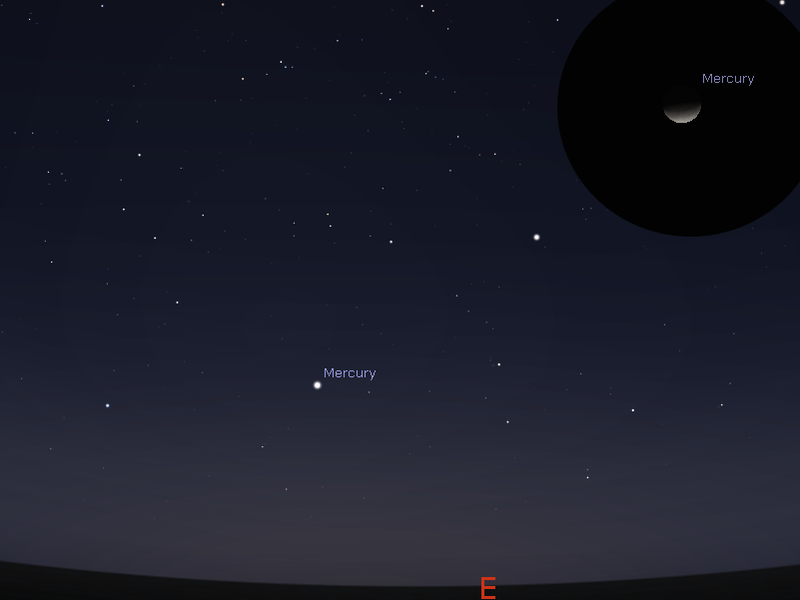 In even a small telescope the "half moon" shape of Mercury will be visible. Jupiter is rising in the early evening, and is now a good telescopic object in the late evening. There are some good Jovian Moon events this week. Jupiter is at opposition next week, and is in an excellent position for telescopic observation. Jupiter is rising as Venus is setting. Saturn has entered the evening sky, although telescopically it is still best in the morning sky. It is within binocular range of several attractive clusters and nebula. 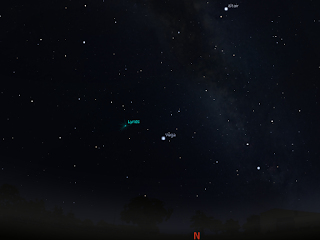 It is close to the bright globular cluster M22 and the pair are visible in binoculars and wide field telescope eyepieces. The SWS has issued a geomagnetic warning and aurora watch for 21 April (UT) due to ongoing solar wind streams from a coronal hole. This can be anytime the UT day on the 21st. The SWS predicts active conditions with the possibility of outbreaks of minor storms. If these geomagnetic events occur and result in aurora they could be seen from Tasmania weather permitting. The Moon is waxing and will not interfere with aurora. Be patient, as the activity may rise and fall of the magnetic polarity of the wind may fluctuate significantly. Current condition are not yet conductive to aurora. active levels on April 21, with possible isolated minor storm periods. Venus and the Crescent Moon, Wednesday 18 April. Venus and the crescent Moon on Wednesday 18 April, looking west at 18:21 ACST. Canon IXUS, 3xzoom, 1 sec exposure ASA 400. Click to embiggen. Image taken with my mobile phone almost immediately after, no idea of the conditions. Resolution is less than the canon shot. Click to embiggen. After cloud and rain wiping out the Moon-Venus conjunction on the 17th, conditions tonight were good enough that I got the closer pairing of Venus and the Moon. The clouds made Venus a bit hard to see, but the twiligh glow made the whole scene rather spectacular. Tomorrow will have the Moon further away from Venus but close to Aldebaran, which should look nice as well. The First Quarter Moon is Monday, April 23. 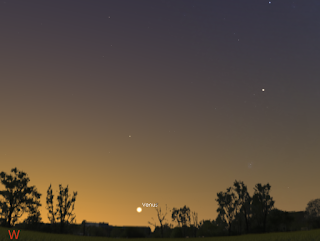 Venus is low in the twilight and is visited by the Moon on the 19th. Jupiter is now rising in the early evening skies. 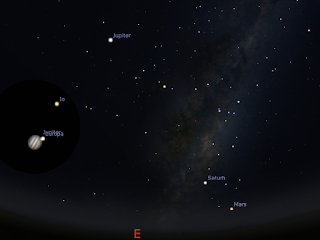 Mars and Saturn are now visible in the late evening skies. Mercury is prominent in the morning skies. 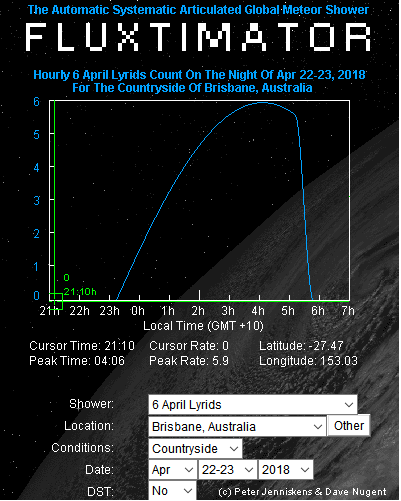 The Lyrid meteor shower peaks on the morning of the 23rd, but is really only visible form Brisbane and places north. The First Quarter Moon is Monday, April 23. The Moon is at perigee, when it is closest to the Earth, on the 21st. Evening twilight sky on Thursday April 19 looking west as seen from Adelaide at 18:14 ACST (30 minutes after sunset). Venus is just above the horizon in the twilight. The crescent Moon is above it close to the bright star Aldebaran. Venus is rising higher in the twilight. While is is now much easier to see, you will still need a flat unobscured horizon to see it at its best. Venus is visible to the unaided eye from 15 minutes after sunset, easy to see 30 minutes after sunset and can potentially be viewed as late as an hour after sunset if you have a flat, unobstructed horizon. Evening sky on Saturday April 21 looking east as seen from Adelaide at 23:00ACST. Jupiter is high above the horizon. Saturn is close to the horizon and Mars is just rising. The inset is a simulated telescopic view of Jupiter and its moons at 3:00 ACST on the 22nd, with Europa and its shadow transiting the face of Jupiter. Morning sky on Saturday April 21 looking north as seen from Adelaide at 5:19 ACST (90 minutes before sunrise). Mars and Saturn are high above the northern horizon and good telescopic viewing. The inset is a simulated telescopic view of Saturn and the globular cluster M22. Morning sky on Saturday April 21 looking east as seen from Adelaide at 5:45 ACST (60 minutes before sunrise). Mercury is the brightest object closest to the eastern horizon. The predicted ZHR this year is 18 meteors per hour. This means that under ideal conditions, you will see a meteor on average about once every three minutes. This can be as interesting as watching paint dry. Also, while that meteor every three minutes is the average, meteors are like buses, you wait for ages and then a whole bunch turn up. But alos, that is under ideal conditions. 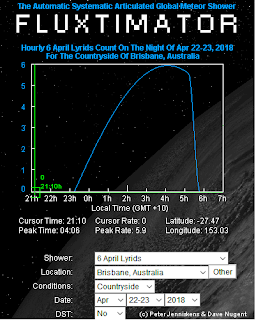 In Australia, where the radiant is very low above the horizon, you are likely to see a meteor once every 10 minutes from the latitudes of Brisbane, far fewer to the south of this, with the best rates seen from Cairns and Darwin. Venus is now sufficiently high in the evening twilight to be readily visible above the horizon if there are not too many trees or buildings in the way. It is now over a hand-span above the horizon 30 minutes after sunset. It is bright enough to be visible 15 minutes after sunset and easy to see 30 minutes after sunset and can potentially be viewed as late as an hour after sunset if you have a flat, unobstructed horizon. On the 19th the thin crescent Moon is near Venus. 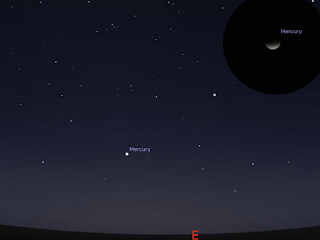 Mercury has returned to the morning sky, and now is in an excellent position for observation. Mercury is the brightest object closest to the eastern horizon. Jupiter is rising in the early evening, and is now a good telescopic object in the late evening. There are some good Jovian Moon events this week. 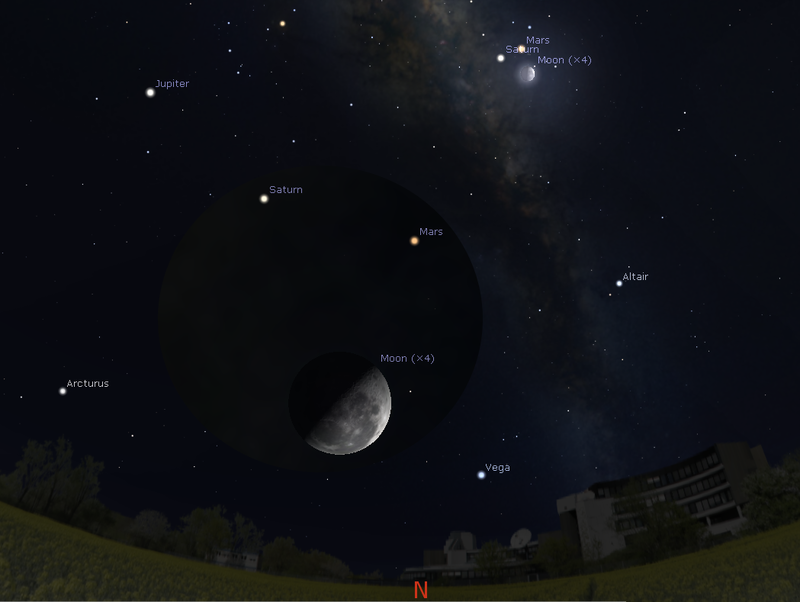 The New Moon is Monday, April 16. Venus is low in the twilight and is visited by the Moon on the 19th. Jupiter is now rising in the early evening skies. 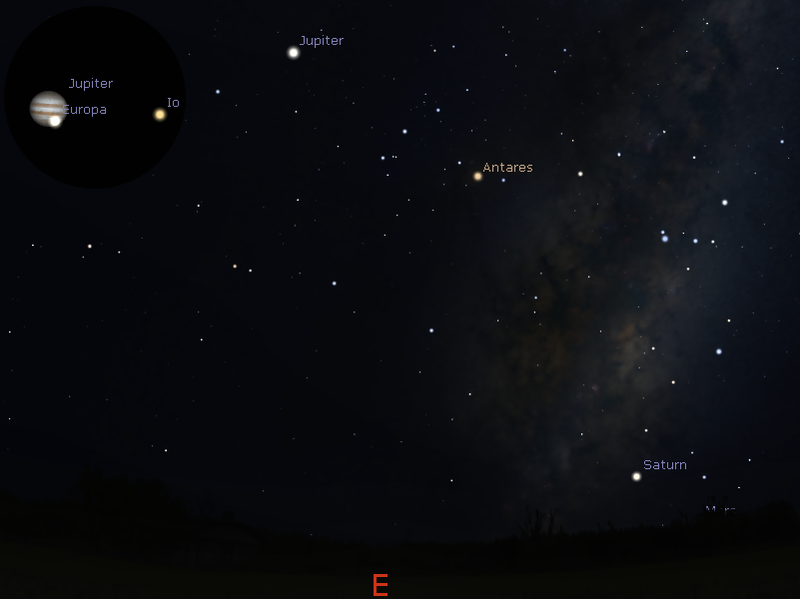 Mars and Saturn are now visible in the late evening skies. Mercury returns to the morning skies. The New Moon is Monday, April 16. Venus is rising higher in the twilight. While is is now much easier to see, you will still need a flat unobscured horizon to see it at its best. Venus is now visible to the unaided eye from 15 minutes after sunset and easy to see 30 minutes after sunset and can potentially be viewed as late as an hour after sunset if you have a flat, unobstructed horizon. Evening sky on Saturday April 14 looking east as seen from Adelaide at 23:00ACST. Jupiter is high above the horizon. Close to the horizon Saturn is just rising, and Mars will soon follow. The inset is a simulated telescopic view of Jupiter and its moons at 1:30 ACST on the 15th, with Ganymede and its shadow transiting the face of Jupiter. Morning sky on Saturday April 14 looking north as seen from Adelaide at 5:14 ACST (90 minutes before sunrise). 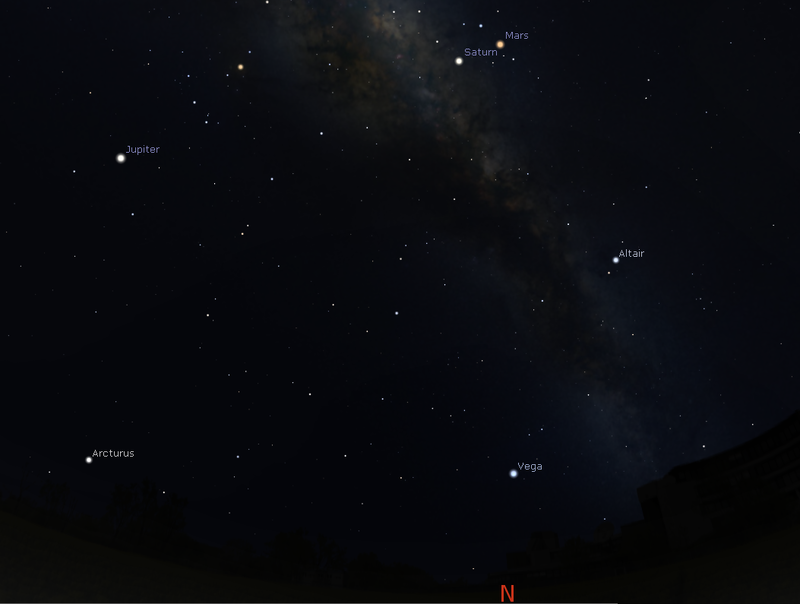 Mars and Saturn are high above the northern horizon and good telescopic viewing. Venus is now sufficiently high in the evening twilight to be readily visible above the horizon if there are not too many trees or buildings in the way. It is now over a hand-span above the horizon 30 minutes after sunset. It is bright enough to be visible 15 minutes after sunset and easy to see 30 minutes after sunset and can potentially be viewed as late as an hour after sunset if you have a flat, unobstructed horizon. Mercury has returned to the morning sky, but will be difficult to see until next week. Saturn has entered the evening sky, although telescopically it is still best in the morning sky. It is within binocular range of several attractive clusters and nebula. It is close to the bright globular cluster M22 and the pair are visible in binoculars and wide field telescope eyepieces. Saturn is at aphelion on the 17th and appears motionless against the background stars. The Last Quarter Moon is Sunday, April 8. Venus is low in the twilight. Jupiter is now rising in the early evening skies. 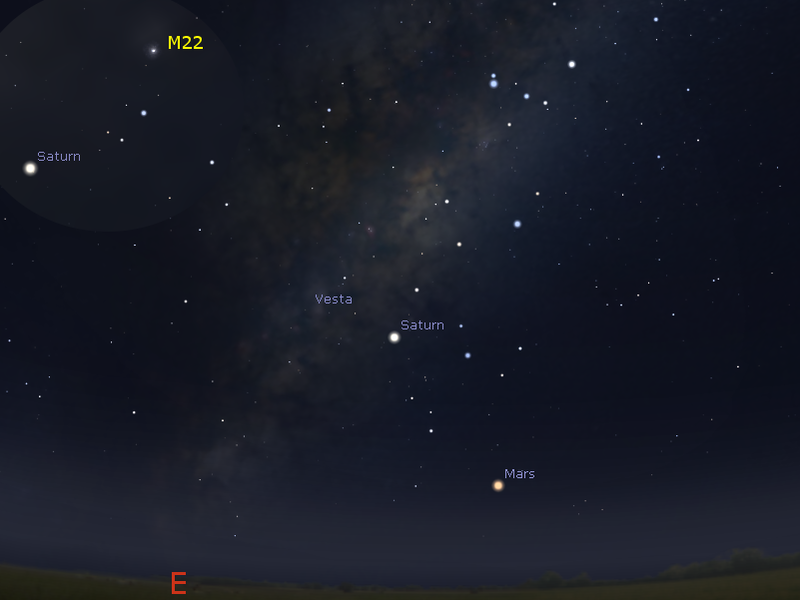 The waning Moon visits Saturn and Mars on April the 7thrd. 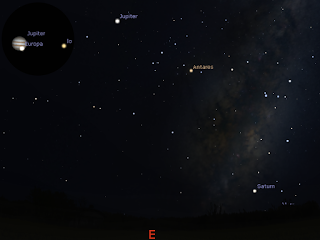 Mars, bright Jupiter and Saturn form a line together with the bright stars Antares and Spica in the morning skies. Mars and Saturn are now visible in the late evening skies. The Last Quarter Moon is Sunday, April 8. The Moon is at apogee, when it is furthest from the Earth, on the 8th. Evening twilight sky on Saturday April 7 looking west as seen from Adelaide at 18:27 ACST (30 minutes after sunset). Venus is just above the horizon in the twilight. Venus is rising higher in the twilight. While is is now much easier to see, you will still need a flat unobscured horizon to see it at its best. Venus is now visible to the unaided eye from 15 minutes after sunset and easy to see 30 minutes after sunset. Evening sky on Saturday April 7 looking east as seen from Adelaide at 23:59 ACST. Jupiter is high above the horizon. Close to the horizon is the triangle of Saturn Mars and the Last Quarter Moon. The inset is a simulated telescopic view of Jupiter and its moons at 23:00 ACST, with Ganymede and its shadow transiting the face of Jupiter. Morning sky on Sunday April 8 looking north as seen from Adelaide at 5:09 ACST (90 minutes before sunrise). Mars, Saturn and the Last Quarter Moon form a triangle. The inset shows the binocular view of Mars, Saturn and the Moon. Because of the closeness of the bright Moon the faint deep-sky objects will be difficult to see. Venus is now sufficiently high in the evening twilight to be readily visible above the horizon if there are not too many trees or buildings in the way. It is now over a hand-span above the horizon 30 minutes after sunset. It is bright enough to be visible 15 minutes after sunset. Mars is in Sagittarius the archer and is now rising in the late evening. 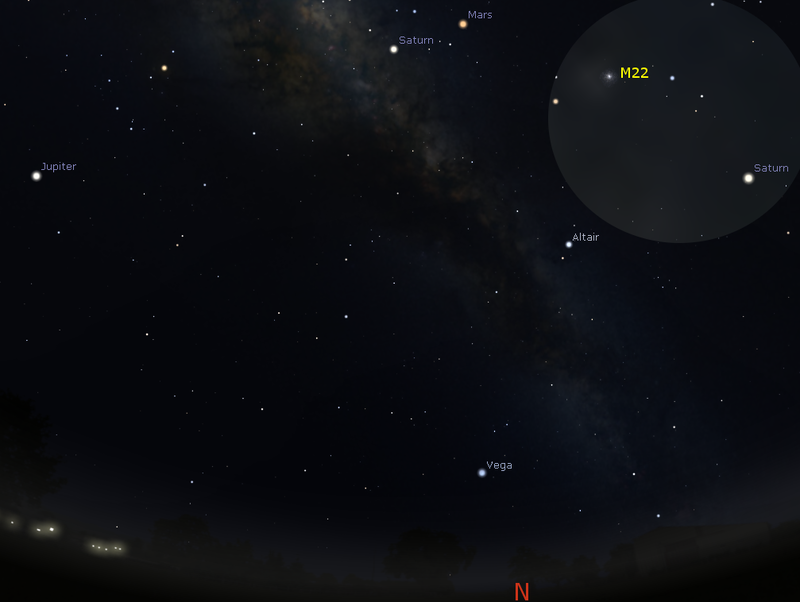 Mars is away from Saturn and the globular cluster M22. Mars and Saturn and M22 start the week within binocular range of each other. On the evening of the 7th and the morning of the 8th the Last Quarter Moon is close to Saturn and Mars, forming a triangle. The proximity of the Moon makes viewing the fain deep sky objects difficult. Saturn has entered the evening sky, although telescopically it is still best in the morning sky. It is within binocular range of several attractive clusters and nebula. It is close to the bright globular cluster M22 and the pair are visible in binoculars and wide field telescope eyepieces. Mars and Saturn are within binocular range of each other. On the evening of the 7th and the morning of the 8th the Last Quarter Moon iis close to Saturn and Mars, forming a triangle. The proximity of the Moon makes viewing the fain deep sky objects difficult.